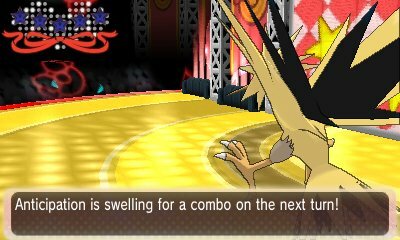 Much like the original Pokémon games, sometimes when you use a move in the contest, it starts a combo which, when completed, gives you even more points boosted to your Contest score. These combos are slightly different to the ones that exist in the original games, and in Diamond & Pearl, but there are a few which make a return.. Many of the combos are similar and share the same starting or ending move. If you manage to pull the combo off, then you will get a lot of extra points.